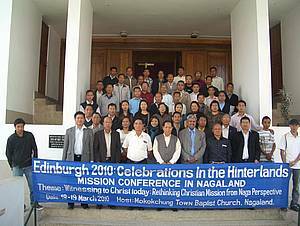 A mission conference for mission secretaries and association executive secretaries was hosted by Mokokchung Town Baptist Church on 18-19 March 2010. The conference was organized along the centenary celebrations of the historic World Mission Conference at Edinburgh 1910. The theme of the conference was: “Witnessing to Christ today: Rethinking Christian Mission from a Naga Perspective”. The resource persons included: Drs. Narola Imchen, Sanyu Iralu and Rev. Noel Kotian. Plenary session included: Akhrieno Savi, Dr. Eyinbeni Humtsoe, Khontele Seb, Noksa Chiu, Nuklu Phom, Dr. Toshi Jamir. Morning devotions were conducted by Rev. Dr. Takatemjen and Rev. Dr. Mero. Rev. Dr. Sanyu Iralu, gave an inspiring and practical challenge in the closing session titled “Envisioning Naga Mission for 21st Century”. Rev. Ponen Longchar delivered the welcome and introductory address, Mr. Temsuwati was the coordinator of the program. Read a full report of the event here.